Save up to 37%, why not try? 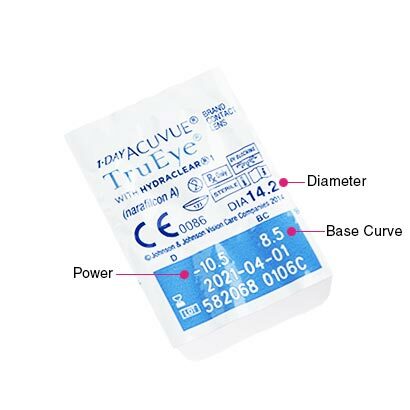 A silicone hydrogel addition to Johnson & Johnson’s best-selling Acuvue range, 1 Day Acuvue TruEye are available in this 90-pack edition, offering even better value for money when you buy daily contact lenses online. Enjoy freedom from glasses and crystal clear vision, with ultra-comfortable contact lenses that will make you feel like you’re not even wearing lenses. Allowing up to six times more oxygen to reach the eyes than standard hydrogel contact lenses, 1 Day Acuvue TruEye (90 Pack) contacts keeps your eyes feeling fresh while making sure they stay moist and healthy all-day long. These impressive daily contact lenses also work hard to retain moisture, with Hydraclear® 1 Technology maintaining the wettability of the lens and hydrating eyes even as the day goes by. This is an ideal feature for anyone used to working long hours in front of the computer, or in air-conditioned environments, with these daily disposables offering all day comfort alongside exceptional visual correction. As these 1 Day Acuvue contact lenses are daily disposables, you won’t have to take the time to clean and store them every night. You’ll just be disposing of your lenses every night before bed and applying a new pair the next morning. This means you can enjoy a fresh pair of contact lenses every day, ensuring your lenses are comfortable to wear and eliminating the risk of infection. 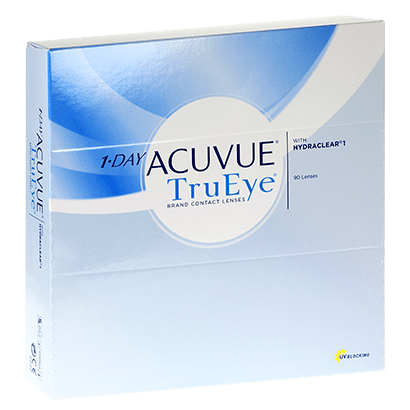 This 90-pack provides excellent value for money, while we also stock 1 Day Acuvue TruEye (90 Pack) contact lenses in a 30-pack edition at FeelGoodContacts.com. comfi Pure 1 Day are similar lenses. Extremely comfortable and brilliant fit. I swear by these. They are perfect for a lifestyle where you need extended wear. This is a great product if you have sensitive eyes. Feelgood offer an efficient service and deliver promptly. Very comfortable lenses don''t know you''re wearing them. Great clarity of vision. Great lenses that you can wear all day. i decided they were worth the little extra over the usual Acuvue Moist. I''ve tried many brands of lenses over the years and these are without doubt the best. Working long shifts, in air conditioned environments, then driving for miles has never been so comfortable! I wear them for over 16hours a day. Excellent quick delivery and a free mini pack of Haribo that my son enjoyed! Thanks. Helps me see so I buy them!! Haven''t received although previously they always on time. Need double check. great lenses and very comfortable ... have used for years! Comfy lenses - never dry out for me. Never had an issue with these, feel good on the eyes and able to wear them during long days. The best contacts i''ve ever worn, recommended by my optician as i wear every day and although feel slightly thicker due to the material they are made from v Moist; they are way more comfy even after the longest days.... Not cheap, but you get what you pay for. A top class product; first rate service and competitive price. Best. Very comfortable which I have used for many years. Great product. Wear all day with out getting tired. All as described good comfortable lenses. After wearing contact lenses for 20 years, I started to suffer from dry eyes which made wearing them uncomfortable after 6 hours. 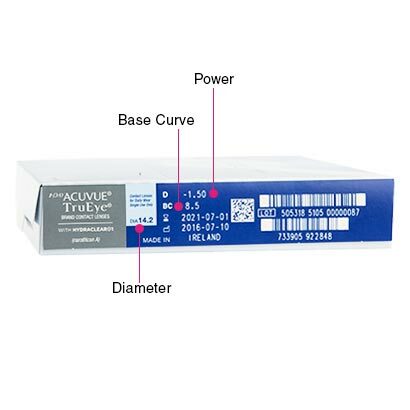 My optician recommended switching to the 1 Day Acuvue TruEye. They are slightly more expensive than other brands, but I haven''t suffered from eye problems since! I can easily wear these for 12 hours or longer. It was very good service and satisfied with the quick delivery. In the last couple of 90 day batches, I have had up to 5 lenses fail on me. When I open them from the casing, they are shriveled around the edges and have lost their shape hence they do not fit on the eye and I have to throw them away. I once had 3 of them like that in a box of 30. Good quality and everyday use product, will use again. Very comfortable, high quality contact lenses. I wouldn''t go back to any other lenses. Very comfortable although I do get the odd misformed lense. These lenses are so incredibly light and comfortable that I sometimes even forget I''m wearing lenses! Also, these products are great for me as I suffer from dry eyes. Great contact lenses and really efficient delivery - I ordered and received the lenses next day. Wouldn''t hesitate to recommend this company. 1 day TruEye are the best contact lenses I''ve used so far, better than Acuvue Moist. I have very dry eyes and these have been the absolute best so far. Very comfy to wear. I have been using these lenses for about a year with no problems. Very comfortable to wear. Good value for money. I purchased a 6-month supply. Great Product. I love these contact lenses they help me see, see. I use these lens. I think they worked for me. But it is all individually. I think using 1-day lens is not cheap but hygienically. These lenses are superb and worth the price premium in my opinion. Have been used this for years; best on the market. The contacts I purchased are the same ones I was wearing whilst with my opticians. These are slightly cheaper than what I was paying originally but the exact same lenses. So pleased to have found Feel Good contacts and placed my order. Great service, fast delivery, value for money - enough said! I do not normally write reviews but this company impressed me with their speedy delivery and their competitive prices. Perfect! Best lenses ever! Love it! I''ve tried alternatives, such as lower priced options, but come back to TruEye as they give me the longest comfortable daily wear time. These are the best daily contacts I have used, they are more comfortable and less drying to the eye when worn over a long period of times compared to other types I have used before. Haven''t tried any other brand of lenses, but these work great for me.